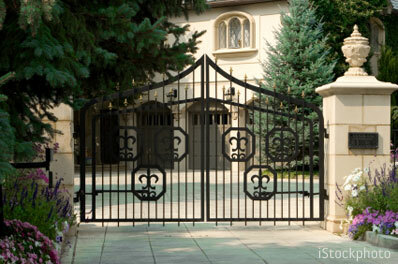 Whether I’m traveling or anticipating the arrival of guests, I worry something will happen while I’m gone. Did I forget to turn off that light in the living room? Will my guests arrive while I’m out picking up more milk? With a smartphone or computer I can easily allay these fears by checking on that light or even unlocking the door. In fact, there are products that provide remote control or monitoring of most of the important systems in a home. Better yet, most of these you can install yourself. Do you want to make sure the neighbor fed your fish, that packages aren't sitting on your front porch or that Fido isn’t sitting on the sofa again? With a wireless video-monitoring camera, you can perform a visual check on your home while you’re away. 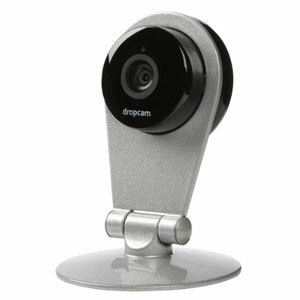 The Dropcam HD is a good choice with its ability to digitally pan and zoom in on a scene. Plus, it has night vision and two-way audio communication (for chastising Fido or otherwise). Video is encrypted and can be saved, based on your needs. Plug any device into the Belkin WeMo Home Automation Switch and you can turn it on or off with your iOS device. So you can make sure the iron is off and the front lights are on wherever you happen to be. You can also set the WeMo outlet to work on a schedule, turning on or off at certain times of day. 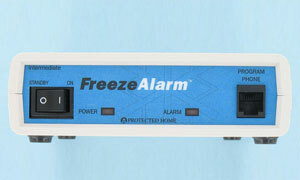 You won’t have to worry about the pipes freezing in your cabin upstate with the Control Products FA-I-CCA Intermediate FreezeAlarm on duty. The sensor plugs into a regular phone line and will call up to three numbers when the temperature goes below (or above) a set temperature—whether the power in your home is on or off. You can also call in to check the current temperature, see if the power is on and find out whether the backup battery is working. There’s no need to turn down the thermostat when you leave town for the weekend. 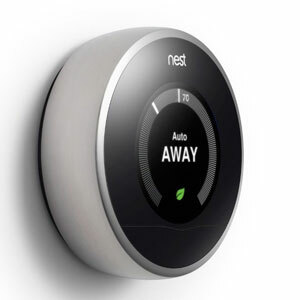 The Nest thermostat has sensors built-in so it knows when you’re away and will autmoatically go into energy-saving mode. You can also turn up the heat remotely with your iPhone or Android phone so your home is just the right temperature when you arrive. Will the leaky pipe you just fixed in the upstairs bathroom hold over the long weekend? 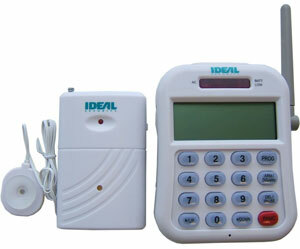 With the Ideal Security Wireless Water and Flood Detector with Telephone Dialer, the wireless sensor will sound an alarm and dial your number if it detects water. Up to 21 additional sensors in four zones can be connected to the included dialer. A backup battery provides service during power outages. Did you remember to close the garage door? 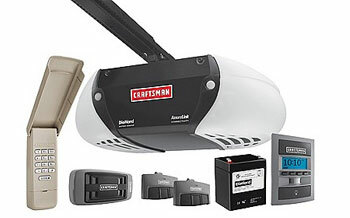 With the Craftsman AssureLink garage door opener you can check the status and operate the door from any iPhone, Android phone or web browser. The built-in backup battery ensures operation even in the event of a power outage. 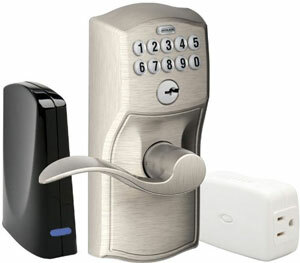 With the Schlage Keypad Lever Home Security Kit with Nexia Home Intelligence you can receive a text message alert when your guests use their unlock code, letting you know they arrived. Or, you can use any computer, iPhone or Android phone to remotely unlock the door. All remote control and alert features require a monthly subscription of $8.99 per month. If you cancel your subscription, the codes will continue to work and you can program new ones manually using the door lock.